You should be all set to play - just load up the game.exe using Wine (version 1.1.32) and the DTF should load right up for you. I hope you all enjoy this lovely title as much as I did. 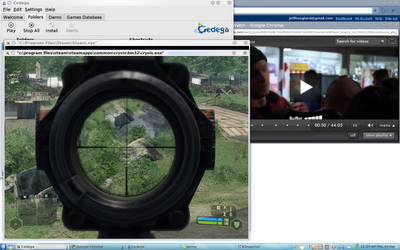 Alrighty - we are all set to play now just load Steam through Cedega using the UT3 profile and launch Crysis. When you load Crysis for the first time under Cedega it will install the same things it did under Wine (DirectX, .NET, and Punkbuster) - however the .NET install will fail. Don't worry, this is expected (its why we copied over the .NET install from Wine) just click continue with installation and everything will run fine. After it finishes with this Crysis should load right up for you and you'll be ready to go! Lastly - one trouble shooting note. 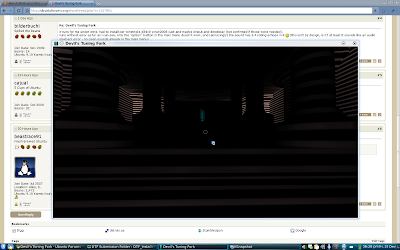 On some systems having the in game Texture detail set above medium (so on High or Very High) causes it to fail to load. If this happens simply set it to medium or low and it should be good to go. 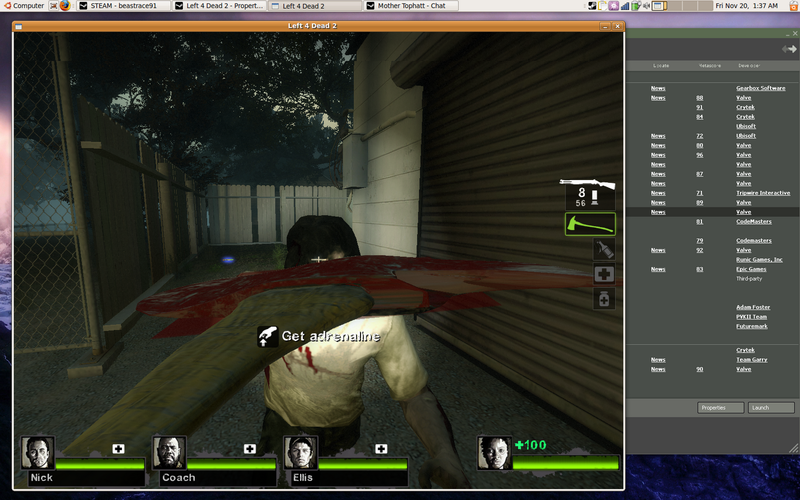 On my own system it runs at a playable frame rate (around 25 fps) under full screen 1024x768 resolution. Remember your own mileage may vary. I typically stick to the software end of technology, but every once in awhile I dig out my set of electronics tools and tear into a piece of hardware. A few months back a friend of mine had given me an old busted up Macbook in exchange for recovering her data off the hard drive. The data recovery went easy enough (once I realized I needed to read the drive as super user in order to see all its files under Linux) and I was shortly in possession of my first ever Apple product. The laptop was in pretty bad shape when I received it. The half of the screen that did work had cracks across it, the battery had seen better days, and the case itself had been covered with more stickers than I had ever seen on one system. It was a slightly older model, an A1181 - one of the first Macs to use an Intel chip, but it would still fully usable if I could get it back into a functioning state. In the end it turned out to be fairly easy to track down all the parts I need for the thing, a few Google searches and 280$ later I had obtained a replacement screen, a new battery, doubled the RAM, and upgraded the old 60gb hard drive to a 500gb one. Not a bad price to have an extra computer around to use. The true thing worth talking about regarding my restoration of the Macbook is the screen replacement. In order to install the new screen I had to disassemble the entire upper portion of the computer. After having to do so I would like to say this: Apple does think differently. The design is poorly done for little reason other than they could. Surrounding the screen alone there are at least four different size screws in various positions. They are all close enough in size they are almost indistinguishable from each other and while magnets to hold the screen shut are a great idea - try removing/replacing a screw right next to a magnet. So in addition to the tediousness you normally experience when working on smaller electronics you also have to take care to note the position of each and every screw you remove so you can be sure they all make it back into the proper spot. Just because I am a glutton for punishment (and curious by nature) I also opted to open up the rest of the computer while I was at it. All in all there are close to ten different screws of varying lengths and head sizes in the laptop (by comparison most other laptops typically get by with only three or four different ones). Around two hours later I had finished my re-constructive surgery of the Macbook and it was ready to be used. My friend had misplaced her discs needed to reinstall OSX so I went ahead and booted Linux Mint on the system. Within half an hour I had the system fully up and functioning - all my replacement hardware was working like a dream. Once I figured out how to set the "Apple" key to be "right-click" I was good to go. The final piece to my story is just another reminder of how stupidly expensive Apple products are. I already owned two laptops before the Macbook (a netbook and a 15.4" gaming laptop) - so I really did not need another computer sitting around the house. After a few days of usage I was sure all my replacement hardware was working as intended I promptly listed the Macbook on Craig's List and within a week I had someone trade me 600$ cash for the A1181 (its amazing what people will pay for hardware with a fruit on the side of it). All in all it ended up being a profitable investment and a learning experience all at the same time (I have since replaced screens in two other Macbooks to the tune of 50$ each). All in all while Apple products are not bad hardware they are very over priced hardware. When it comes to physically taking them apart they are a huge pain to work with (different for the sake of being different and not for the sake of being useful is a poor idea Apple). And lastly - to all the Apple fan boys out there remember your Mac is a Personal Computer. The best conclusion I can come to is that Transgaming no longer sees any profit in Linux gaming and they are instead moving all of their focus to their Cider Mac software (which has has several updates over the last year - adding support for new games and such). I'd encourage anyone wanting to support Linux gaming to not to send Transgaming your hard earned money if this is how they are going to operate. I'd be willing to bet that they have not put out an official statement so they can try to bleed out every last cent out of their dieing product before they put the final nail in it's coffin (if ever). I understand if they need to let the project die - but at least tell as such, don't leave us guessing. Anyone else have input in the situation? I'm letting my Cedega subscription lapse at the end of this month and will not be renewing unless they get their act together and start communicating with their customers. I spend a fair amount of time on UbuntuForums.org and while poking around there this afternoon I came across this thread. It is no where near the first thread I've seen like it (and sadly I doubt it will be the last). To quickly sum up the thread the original poster is detailing why he believes Ubuntu is not ready for the "average user" because of a recent poor experience he had attempting to get Karmic (latest Ubuntu release) installed on a friend's laptop. Ubuntu's motto is "Linux for human-beings" - no where does this imply it is going to be bug free or that Joe Moron is going to be able to get it all setup just fine on their own. Personally I think it is foolish to think that you could ever create a operating system that the average user is going to be able to setup/maintain one hundred percent on their own. Its just not feasible to think as such. I find it amusing that people like to jump on the Ubuntu bashing bandwagon just because an installation (or some piece of setup) goes astray. Ever tell the average user they need to reinstall Windows? Nine times out of ten they will look at you side ways (or if your a tech such as myself they will ask you to do it for them). Does this make Windows less popular or a "not ready" operating system just because you need a professional (or someone with at least some know-how) to get it all installed and running properly? No, it does not. Why should the standard be any different for GNU/Linux? In short I'd like to say this: Linux is more than ready for the average user to be using, but just like any operating system it may be a bit much for the average user to get it setup and thats just fine if you ask me. To most people the computer is simply a means to an end, meaning so long as it turns on when they push the power button, lets them do what they need to do, and then get on with their day - most of them could care less if it is running Windows, Linux, OSX, Free BSD, or anything else for that matter. Personally I find Linux works best for my needs - if something else works for you, wonderus. Just my feelings on the subject, if you have a different or similar idea to add feel free in the comments below. 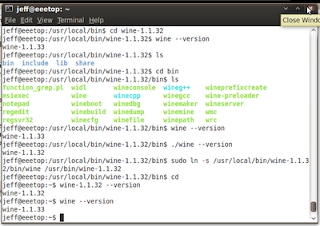 You can install as many different Wine versions as you like in this manner. This way you can feel safe in installing a new Wine version and not have to worry about breaking support for your favorite Windows based application.